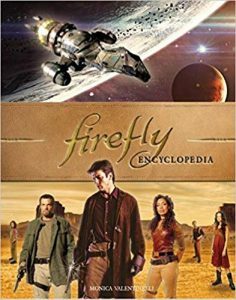 Today is the official U.S. release date for the Firefly Encyclopedia which is available wherever books are sold–including Target! This book is also a strange milestone for me, because this release marks the fifth year I’ve worked with this property. Thus far, I’ve also developed a line of tabletop roleplaying games and wrote The Gorramn Shiniest Language Guide and Phrasebook in the ‘Verse, too, which features an analysis of the language as well as an interview and Mandarin Chinese translations with the incomparable Jenny Lynn. The brand new Firefly Encyclopedia presents a narrative retelling of the story thus far, new interviews, an essay about the scientific plausibility of the ‘verse, an homage to Ron Glass, and much, much more. To celebrate the Firefly Encyclopedia‘s release, I’ve sat down with Mandarin Chinese translator Tony Lee, who lent his talents to provide additional translations. Please enjoy this bonus interview with expert translator Tony Lee! If you’re interested in hiring Tony, I’m happy to forward your information to him so he can follow up. Just use my Contact Monica page and make sure it’s clear I need to pass your message along. Thanks for understanding! He’s not on social media and I don’t want to put his email address on blast. Tony Lee hailed from Taipei, Taiwan but lacked the common sense to go into any profitable fields (like computer or medical), and chose the tabletop gaming industry instead. Over the course of 15+ years, he’s freelanced for Wizards of the Coast/TSR, Pinnacle Entertainment, Margaret Weis Productions, Z-Man Games, and several companies for TTRPG lines ranging from Dungeons & Dragons to the Firefly RPG. Tony’s latest contribution is to the Firefly Encyclopedia. He now works as a Mandarin-to-English translator of mostly—what else?—MMO and cell phone games. You’ve been a Mandarin Chinese translator working in games for years. What was your first (or favorite) project? My first in tabletop gaming was the titles for Z-Man Games’ Shadowfist CCG expansions. In mobile/computer, it was an MMO that I had no idea what was called; it was a rush job and to be honest, I didn’t do well because I wasn’t familiar with the terminology at the time. What was the strangest phrase you had to translate into Mandarin Chinese? You’ve translated English-to-Mandarin and back again. Which process is easier? Why? I’d say Mandarin-to-English is easier for me now. Even though Mandarin is technically my first and native language, I’m much more accustomed to English now and actually have better command compared to Mandarin. I can read Mandarin, no problem, but I don’t always come up with the best and proper word or phrase going from English to Mandarin. Often enough that it’s on the tip of my tongue but just can’t grasp it quite enough to put down on paper. What are some important things to consider when hiring a translator? Anybody can transliterate; you can just use Google for that. You want someone who translate by meaning, not by individual words, otherwise you get a funny, nonsensical appliance instruction manual. What you look for is how well a translator “localizes”, using all conventions of the target language that you can’t tell it was a translation. This involves attention to details as well. For instance, in China they put the dollar sign behind the amount (“10$”) but it’s the other way around here in America (“$10”), so it’s simple to spot a “translator” vs. a “localizer” with little things like that. What’s the one thing Browncoats may not know about the Chinese in Firefly? It’s been mentioned that nobody speaks Chinese like that in real life (or something to that effect), but I think Firefly Chinese would be easier to learn since, ironically, it’s somewhat heavy on transliteration and very simple in sentence structure (which is why no one talks that way). I can see the language changing to fit the new Sino-American society of the universe. I’d like to thank Tony Lee for his contributions to the Firefly Encyclopedia, and am happy his work has the ability to shine. Yay! For additional information about the language used in Firefly, you can also find a wonderful interview with Jenny Lynn in the The Gorramn Shiniest Language Guide and Phrasebook in the ‘Verse. Shiny! Today, I am thrilled to announce that I am the Firefly brand manager for Margaret Weis Productions. I will also be writing for the line, too! Margaret Weis has been a joy to work with and I have a fantastic team filled with very, very talented people. The Firefly license, which encompasses the hit Fox television series by Joss Whedon, will incorporate role-playing games and supplements so you can game in the ‘Verse.